Contact Us Today!Commemorative concrete benches can be personalized to honor associates for years of devoted service, memorialize family and friends, commemorate service members or simply provide a place of remembrance. Our engraved memorial benches are built to last, with structurally reinforced frames for maximum durability. Each commemorative bench is available in two different finish options, including exposed aggregate and sandblast; and three leg styles, legacy, park and classic. Our memorial concrete benches are also available with recycled plastic lumber or all concrete back and seat. Our concrete benches are great for dedication, county fair association bench programs, city and park memorial bench programs, school fundraisers and more. 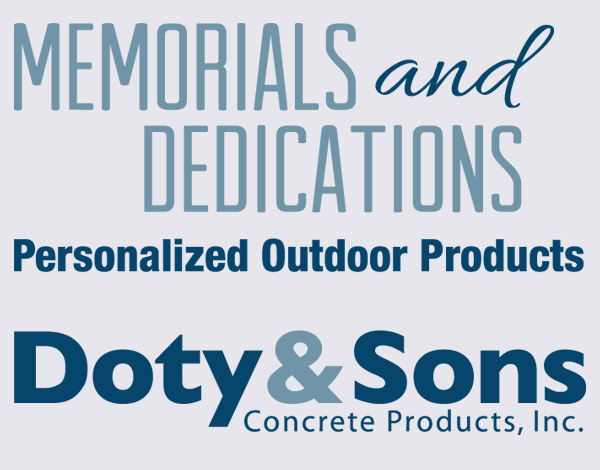 Founded in 1948, Doty & Sons Concrete has been manufacturing high-quality concrete products for over 70 years. We are committed to providing quality memorial products to give you with the closure you need by visually representing your loved one. Interested in learning more about our commemorative concrete benches? Contact us today for more information on customizing your bench. Benches available with recycled plastic lumber or all concrete back & seat. ENGRAVED LUMBER: Personalized Park Style and Classic Style Benches make excellent family gifts, recognition of work done in the community, memorials, class gifts and also can be used to designate golf course tee offs and yardages. Bronze or marble plaque installed.